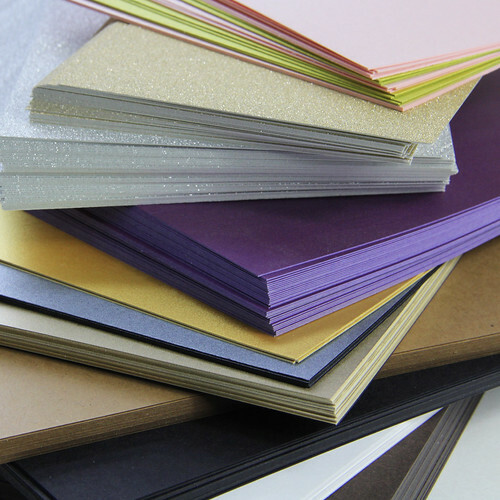 LCI Paper is a feast for paper lovers with its selection of hundreds of fine specialty papers/card stocks, envelopes, and print services for paper professionals and enthusiasts alike. Use their products to create beautiful invitations, personalized party napkins and favors, boxes, and any paper project you have in mind. Looking for high quality card stock in just the right shade of blush for your wedding? Find it here: blush pink card stock and envelopes. Perhaps you've fiddled with printing on gorgeous translucent vellum... LCI Paper will do it for you, no muss, no fuss. Another service is popular white ink printing on dark card stock. If the LCI Paper name sounds familiar, you might recall these DIY tutorials here on All Things Paper created with their pretty papers: Easy Pocket Card Holders with Glitter Paper, Tiny House Ornament, and Simple Ornament Cutout Cards. 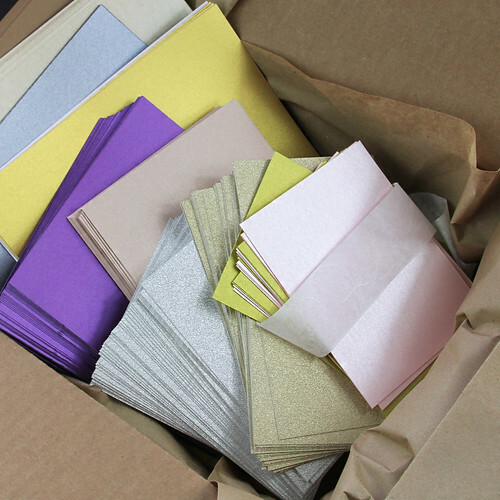 LCI Paper sells 125 Japanese papers, including silkscreen Yuzen, tissue, and pearlized paper. 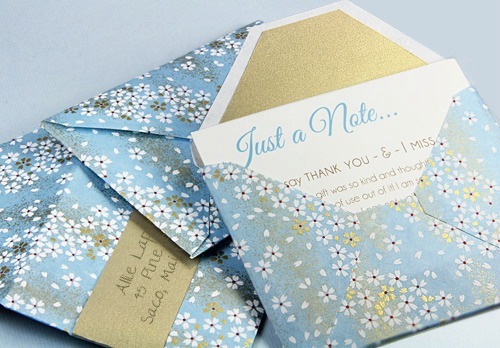 Choose a patterned variety to make these DIY Custom Envelopes. Now, about the giveaway! There will be three U.S. winners. Each will receive a box (approximately 8 pounds(!) 13 x 10 x 4 inches) of colorful scrap paper and card stock sent directly from LCI Paper. Paper weights, sizes, and colors will vary from box to box, but all pieces will be larger, usable sizes, up to 8.5 x 11 inches. To enter: Visit this link at LCI Paper and enter your email address. Return here and comment on this post. Here's proof that I'm a true fan of LCI Paper. 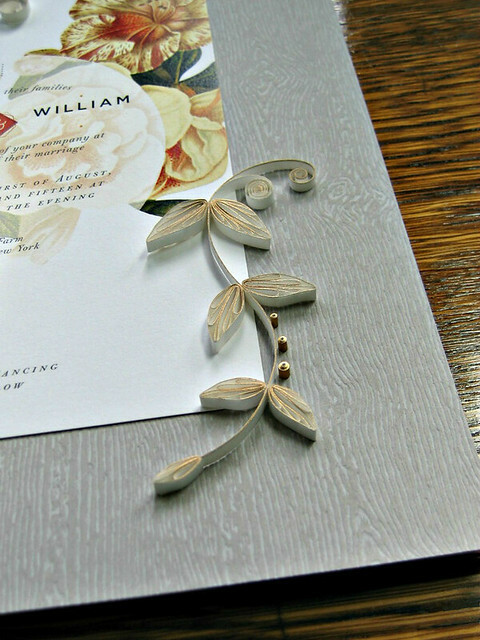 My son and daughter-in-law's wedding invitations were printed on their high quality, smooth card stock, and then I quilled and framed one for them on LCI's tactile wood grain card stock. The same giveaway is underway on Instagram. Enter at one or both places by the end of Saturday, June 16, 2018 to double your chances. Three U.S. winners from all combined entries will be chosen via a random number generator, notified, and announced at the bottom of this post and on the Instagram giveaway photo. Good luck! LCI Paper is on Instagram, Facebook, Pinterest, and YouTube. This is such a fantastic giveaway! I would LOVE to try some of your papers with my paper quilling!! LOVE what you did with your son's invitation! What an incredible opportunity. 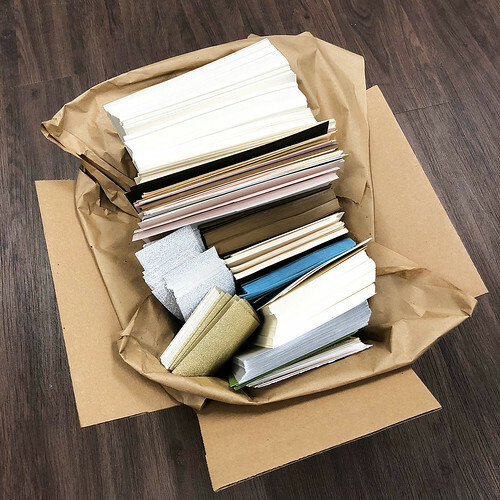 Between scrapbooking, card making, art journaling, and mixed media, these papers would be put to use in incredible ways! What an amazing giveaway! Thanks so much for the chance to win this beautiful paper!!! I haven't heard of LCI but I'm glad I have now. Beautiful! Gorgeous! Love the gleam on the sneak-peeks. These papers are premium quality, and my go to for card crafting. Have used for fund raising card projects, with sell-outs of all items. Thanks for posting your blog, it is so inspiring! Those papers look very cool. As an artist who works solely with paper, this would be an incredible win! Good luck to everyone! I'm in love with every single color!! The metallic finishes are my favorite paper to craft with! OOh, I would love this! Also, it's perfect timing as I have been going through paper like mad with my daughter graduating! Love the colors. They would be great for cardmaking. Thanks for the giveaway! Oh, it would be sublime to win😀 Lots of new papers to try but only can order my regular ones. I love using LCI paper in my classroom. Fabulous for so many art projects! Hope I win this amazing giveaway! Thanks for the timely information. 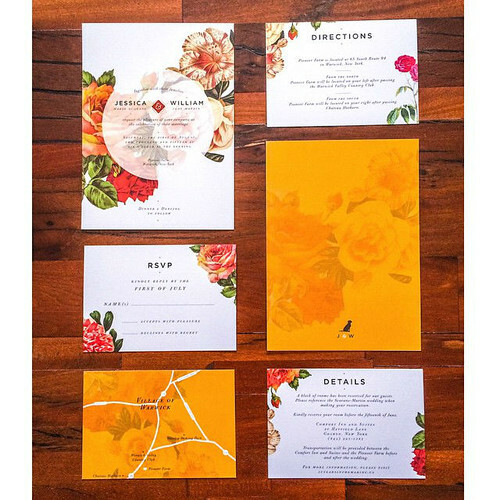 My daughter is getting married this fall and I have been looking for some of the papers on their site for her invites. Thanks again. I just ordered a few samples. This would be an awesome treat at the beginning of summer crafting! Very beautiful paper! Winning an 8 lb. box of this fabulous paper is such a windfall for one lucky person! Good luck to everyone! I love how you have used these beautiful papers. That deep purple 😀 paper is calling out to be stitched! Thanks for offering this giveaway, Ann! A friend suggested your website- It's wonderful! Thanks for offering the paper give way too! What a lovely invitation! And thanks for the invitation to enter the giveaway. I've been a card maker for 25 years, I'd love some of your scraps! These papers are glorious. I can see combining quilling and other items made with a digital paper cutter. Oh the wonders that await! Oh, my! My mouth is watering for all that wonderful paper. Beautiful paper! Thanks for the link and the giveaway! Looks like wonderful papers! Would love to have a box full to play with! Thank you for the opportunity!! 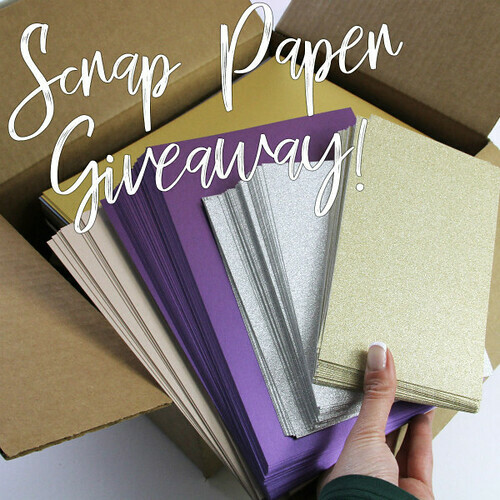 Wow these papers look gorgeous - would love to feel them with my hands ;) thanks for the chance to win! I have liked them on Facebook, Instagram and signed up for their e-mails. Those are some gorgeous papers. Thank you for making me aware of the giveaway. The papers are gorgeous and thank you for the links to past diy! I had never heard of LCI Paper - thanks for the introduction! So many great paper choices. Fabulous paper, am always pleased with the colors and quality. Thank you for providing this source -- I was not familiar and look forward to spending time going through each paper category. Thank you for the give-away. It would be fun to use for cards, albums, paper flowers, etc! Thank you such an amazing giveaway! What an amazing giveaway! These papers are gorgeous. PAPER is my passion since I was very young. I would love to win. Thank you for the opportunity. what an amazing opportunity! A spectacular group of papers that would be amazing to have. So excited over paper! :) have been using LCI paper for my invitations for a few years now. Love the quality, textures and colors! Beautiful colors, textures, and it looks like quality paper! Thank you for not only the opportunity to win but the great ideas shared! SO fun. Do you know if LCI has a showroom? Bethany, LCI Paper is e-commerce only with a warehouse and office in Hudson (central) Massachusetts and is not set up for people to walk around. However, if you would like to call to schedule a time to come by that would be fine. They will ask what items you are interested in seeing so they can have some things out for you when you arrive. I have been looking for a great paper source for cards and quilling..